Screen mockups are a great way and resource for designers to showcase their designs to potential customers and clients in an amazing way. It is important for any graphic designer to have a collection of devices screen mockups so that they don’t need to run to find one when they need it badly. The screen mockups listed in this post are great for showcasing your web designs, app designs, website layouts, presentations and much much more. There are many free screen mockups available on the internet but this post brings you the premium screen mockups because I think being a graphic designer, you should also give these a try. 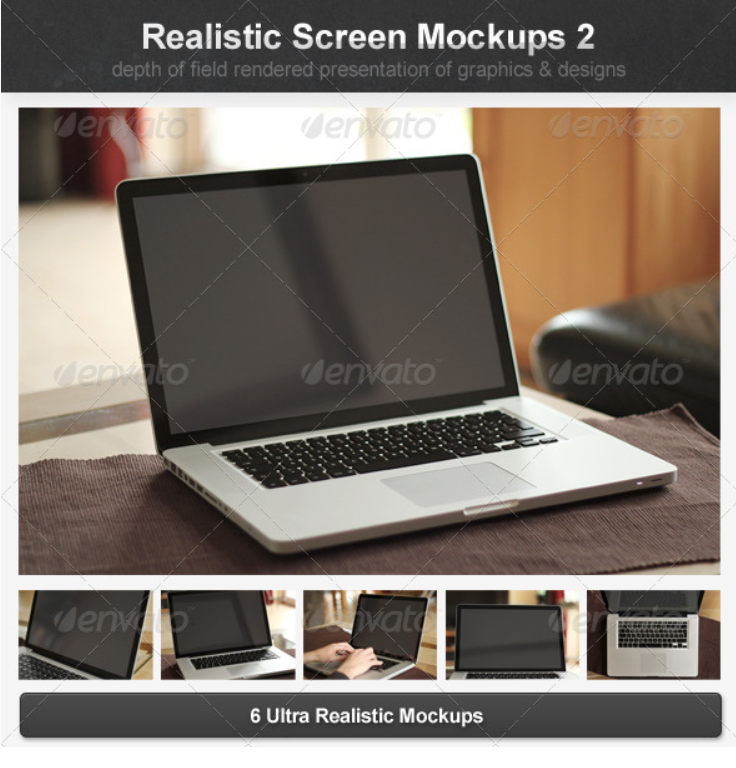 These are some of the most popular and most downloaded screen mockup templates ever. If you are a professional graphic designer and thorough professional in your work, you should have at least one of these in your collection. I hope you will enjoy this post and if you do, please share it with your fellow graphic designers and friends. 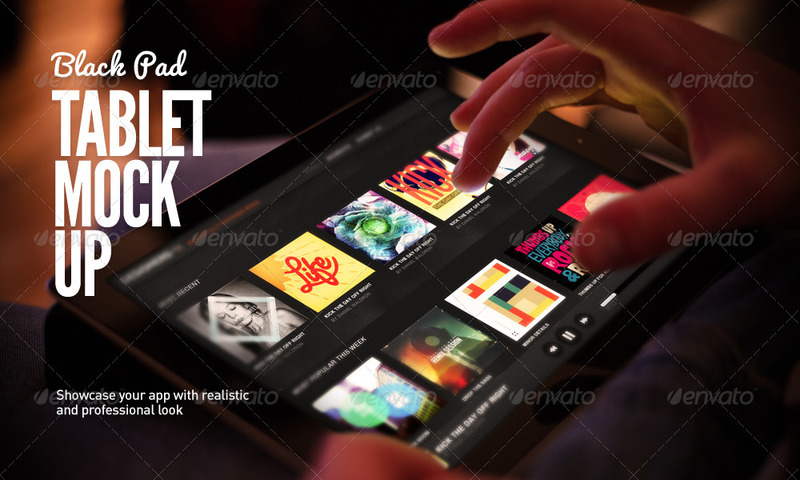 iBundle is the one of the most comprehensive mockup pack you can ever have. It has around 200 modern devices, both in 3D and flat forms. These screen mockups are suitable for any kind of presentation. In this screen mockup set, you will get iPhone 6 (2 colors), iPhone 5S (3 colors, 4 views), iPhone 5C (5 colors, 4 views), iPad Air (2 colors, 3 views), iPad Mini (2 colors, 7 views), iPhone 5 (6 perspectives, black & white), iPad 3 (4 perspectives, black & white), Macbook Pro (4 perspectives), Macbook Air, iMac (3 perspectives), New iMac (7 perspectives), Web Browser and Mouse (2 perspectives). 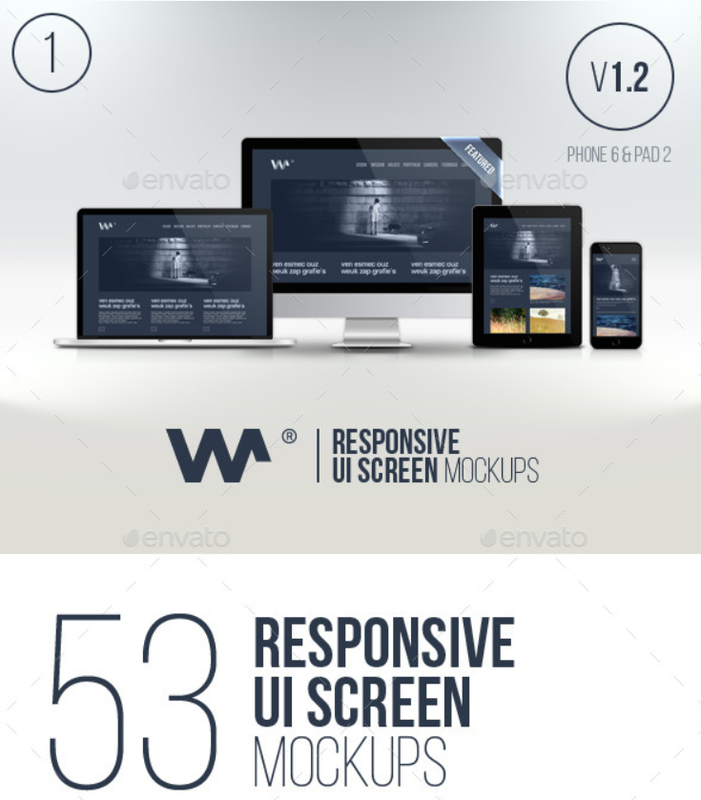 An excellent responsive screen mockup pack to showcase your designs and layouts into digital devices. Each screen mockup is designed using smart layers for quick design insertion. Once you update the smart layer, each and every device running that screenshot is automatically updated. 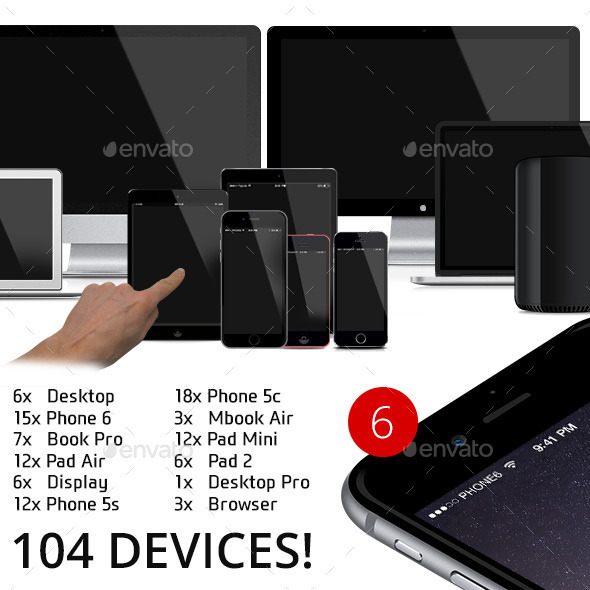 This screen mockup pack contains a total of 28 devices; 8x iPad, 8x iPhone 4S, 8x iPhone 5, 3x Apple iMac and 1x Macbook. This is a set of 16 modern screen mockups that are ideal for showcasing web designs, app designs, UI/UX designs and even photography presentations. The set contains iPhone, iPad, Macbook and iMac mock-up device objects.You can either use them as is or make modifications based on your own requirements. 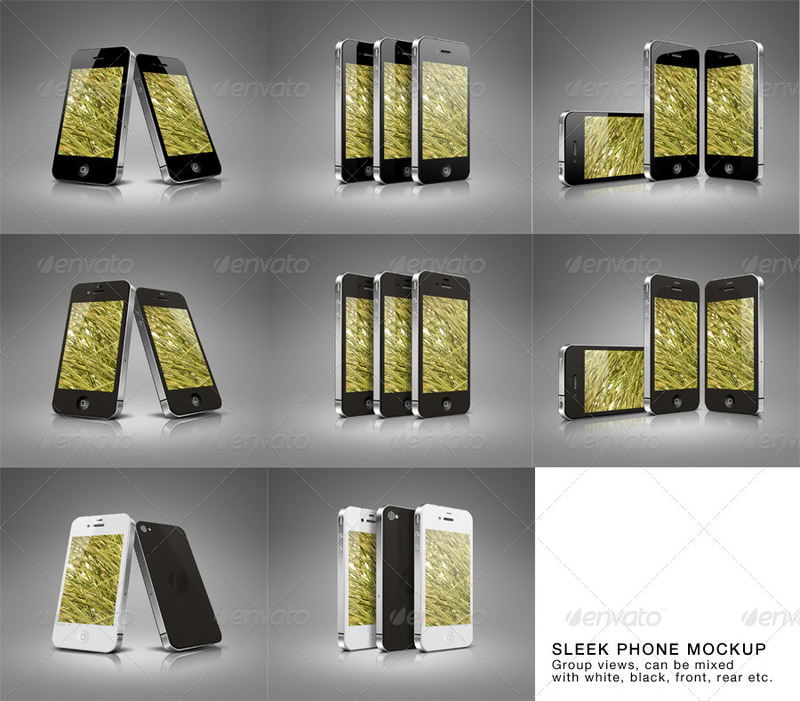 Sleek screen mockup comes with four different screen resolutions to choose from, 2560×1440, 1920×1080, 1600×900, 1280×720. 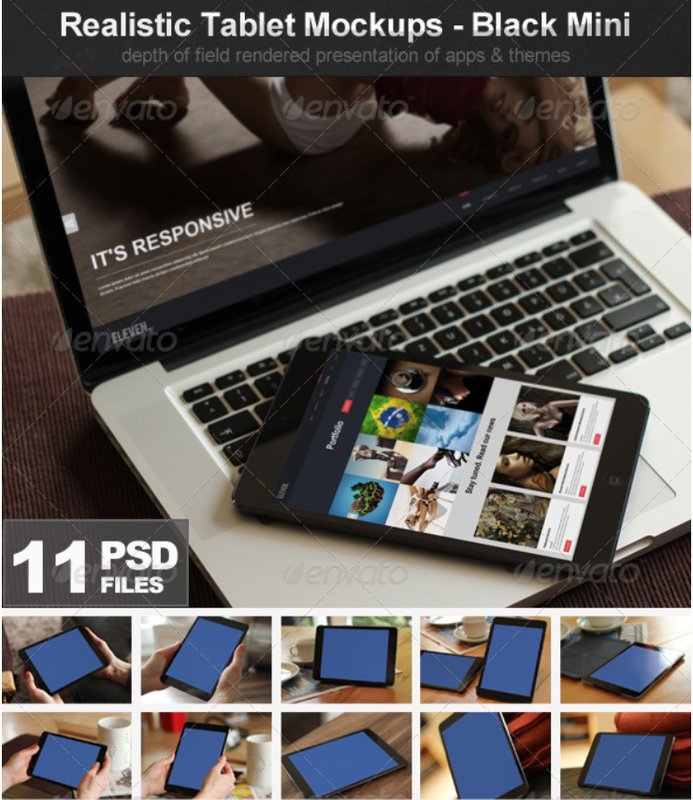 This particular screen mockup set is great for showcasing wallpapers or homepage layouts. 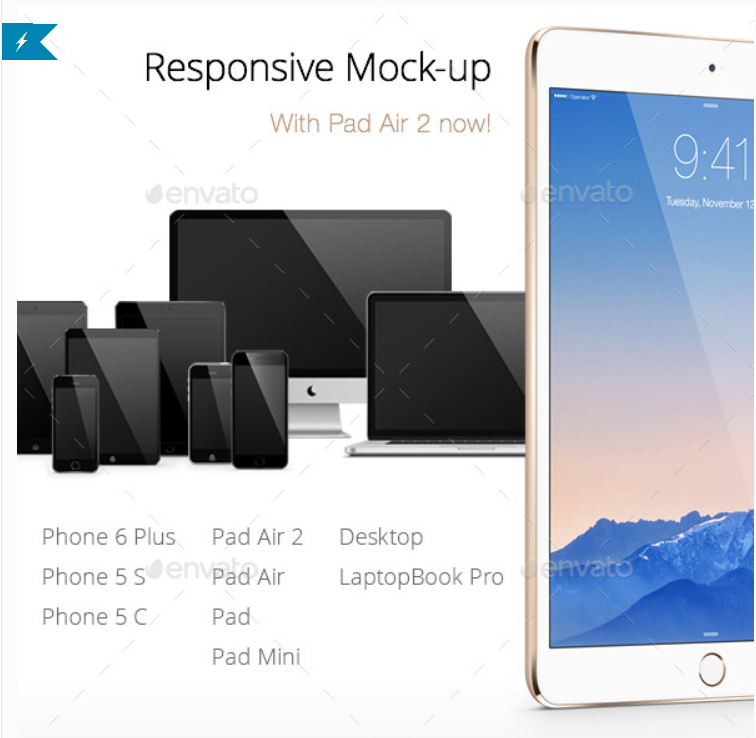 Responsive screen mockup is a huge set of several devices mockups like iPad Air 2, iPad Air, iPad, iPad Mini, iMac, MacBook Pro, iPhone 6 Plus, iPhone 5S and iPhone 5C. It has got 11 ultra realistic and unique tablet mockups. Each mockup is designed using smart objects for easy image replacement and has got perfect depth of field. 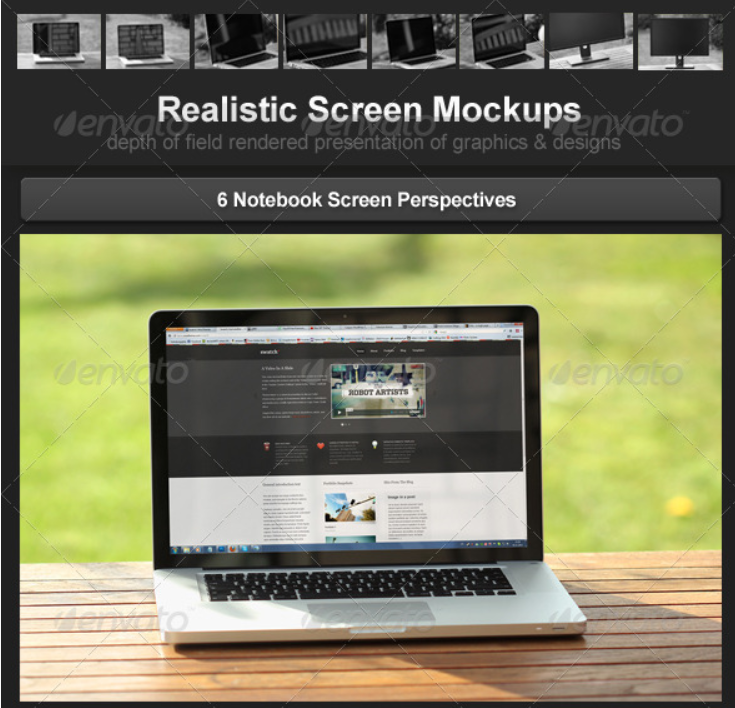 In this screen mockup set you will find different scenes and perspectives with a great resolution of 2400×1600. This set has several hand holding phone mockups in different positions. 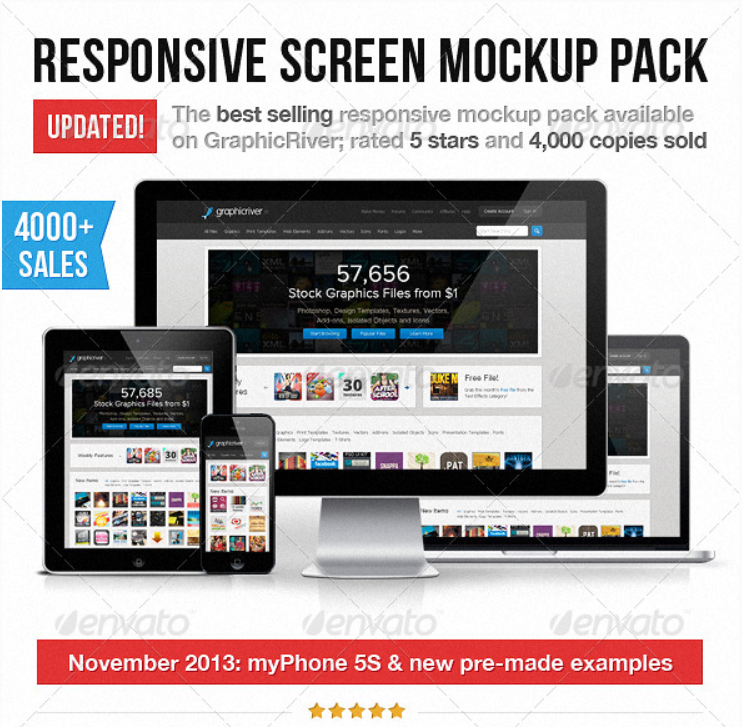 If you make iPhone5 applications and need to showcase them to your clients, this pack is for you. Great set for advertising your apps on a website or in a press-release. 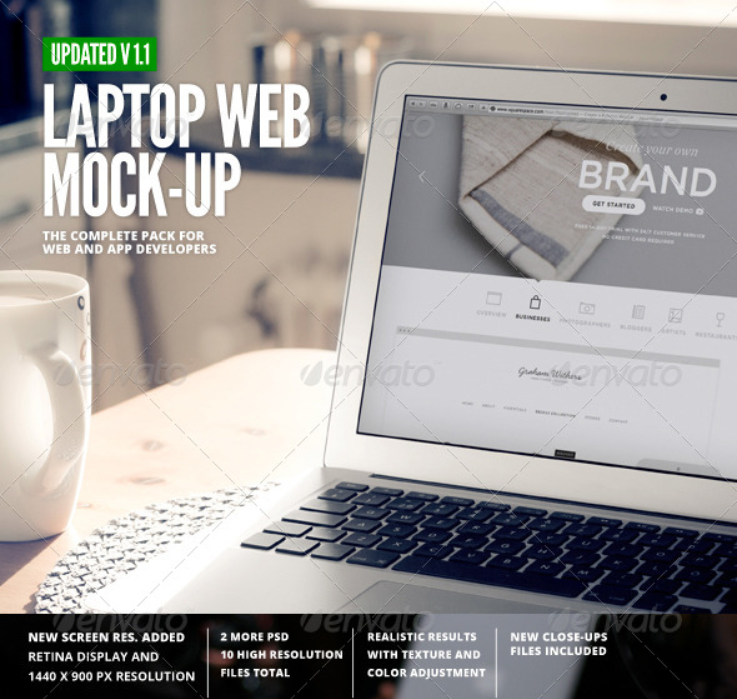 This laptop screen mockup is a special mockup for website developers and applications ui designers to showcase their applicationss in a professional way. 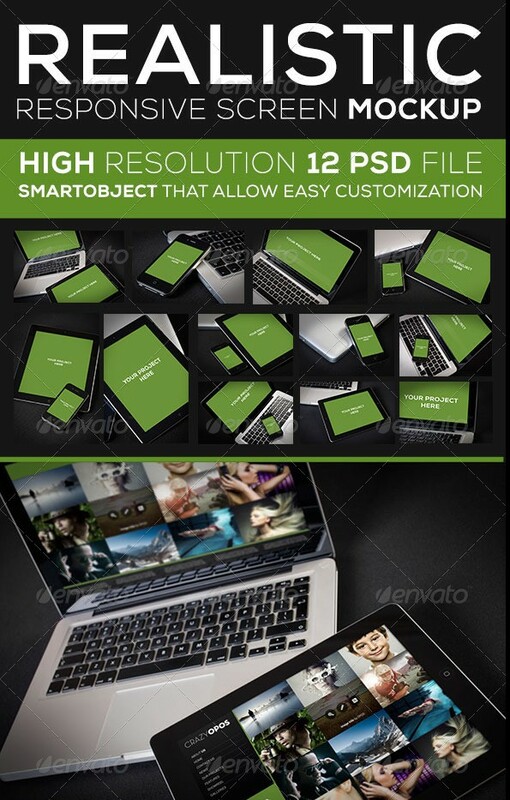 The complete set contains 8 very high resolution PSD files. The sleek phone screen mockup comes with two different screen resolutions ( 1100×1650 and 640×960) to choose from on three different groups of phones and 8 single phone layouts. 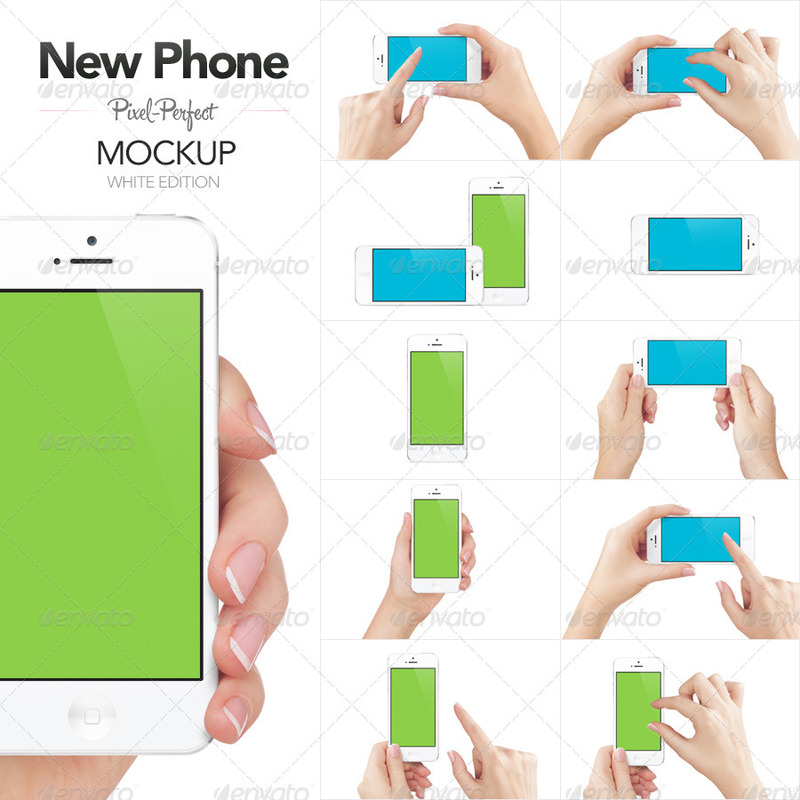 The mockup has pixel perfect images to showcase your apps, wallpapers and other designs. Black Pad is a tablet screen mockup for developers and application ui designers, to showcase their apps in a professional way. Another sleek laptop screen mockup with great features and resolutions (1920×1200, 1440×900, 1280×800, 1152×720, 1024×640, 800×500) to showcase apps, wallpapers, website designs and homepage layouts. 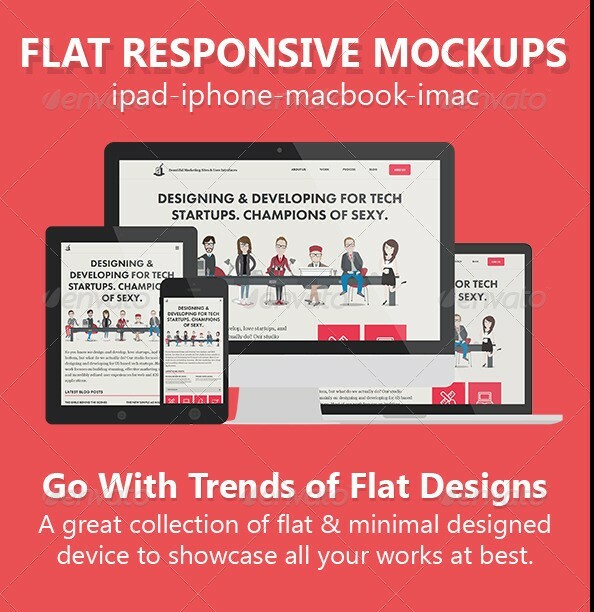 A responsive screen mockup template to display your website on all popular devices including smart phone, computer, laptop & on a notepad. 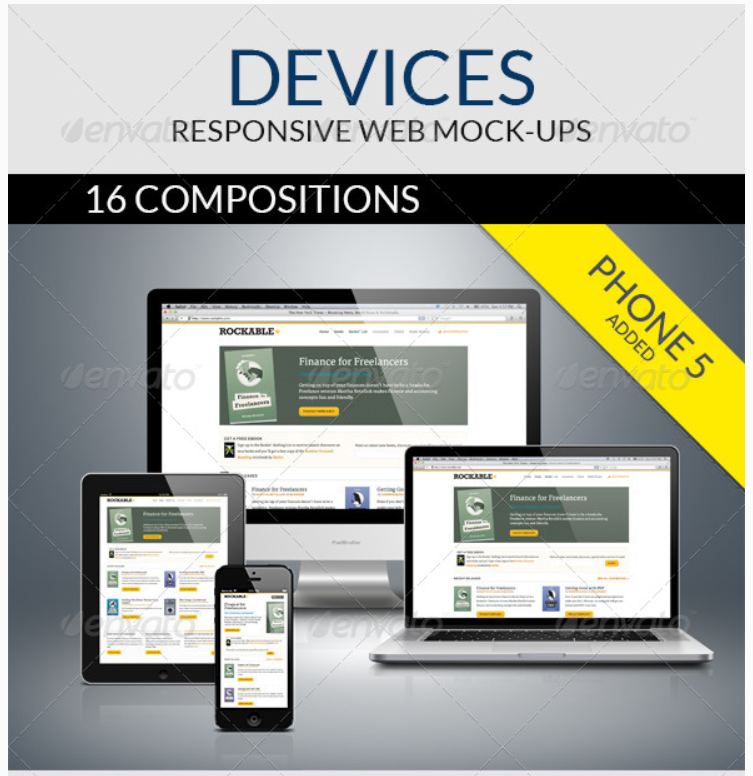 This one has 12 realistic responsive screen mockups designed using Photoshop CS2+ and poses different angles. It’s been designed with a high resolution of 3500×2300 pixels. Ultra Realistic 6 unique screen mockups with different perspectives & closeups. It utilizes the smart objects for easy editing. 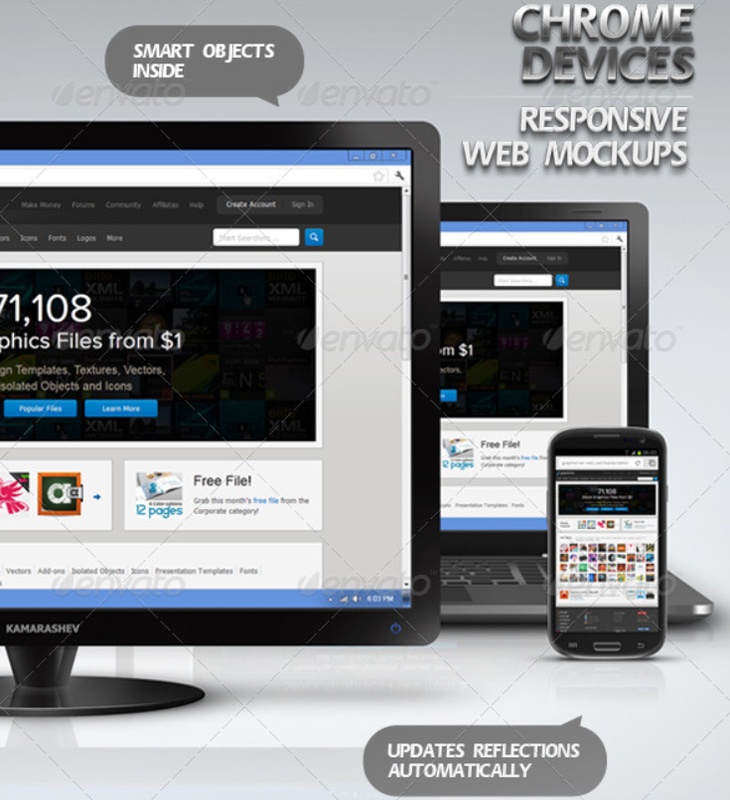 Perfect for showcasing Webdesigns, Themes, UI Design, Wallpapers, Photos, and more. The set has a total of 104 devices screen mockups to choose from. If you get this then I don’t think you will need another mockup for a very long time. 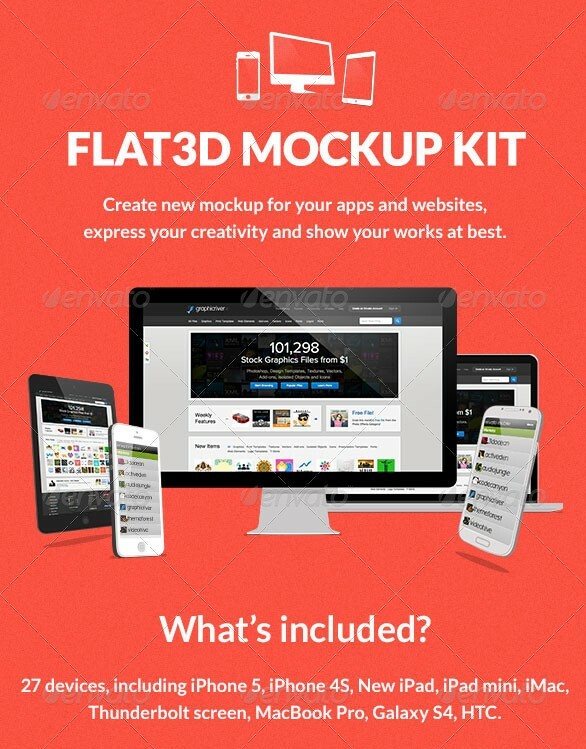 Flat3D Mockup Kit is a resource made of layered 19 PSD and 32 PNG transparent , very useful for designers who want to present their work in an original and amazing way. You can change the color of the devices and choose the position that to you really like . The set contains 12 mockups and utilizes smart objects for easy design replacement. The set comes with video and text instructions to get you started. If you are looking for photorealistic results then this one is a good option. 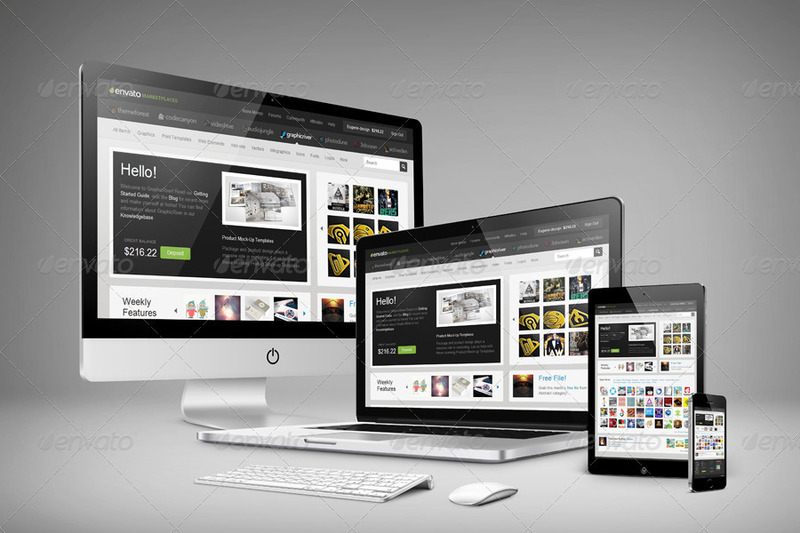 Chrome devices responsive web screen mockups are designed for Windows or Android devices. There are 16 mockups in the set. Each mockup has a black and white version. The reflections update automatically. You can turn off/on reflections or shadows or both if you want to. A smart responsive screen mockup template that will allow you to display your designs in an attractive way through different device setups. All elements are constructed of vector shapes inside the smart objects. You can play even with the dimensions of the elements with any quality loss or distortion. – Illustrator (.Ai) Version of the devices is included. – Everything can be scaled to any resolution and any size without losing quality since all elements are made of vector shapes. A responsive screen mockup to display your website on all popular devices including smart phone, computer, laptop & on a notepad. The package contains : Iphone 6, Ipad Air 2, Mackbook Air, Mackbook pro and Mac screen 5k. 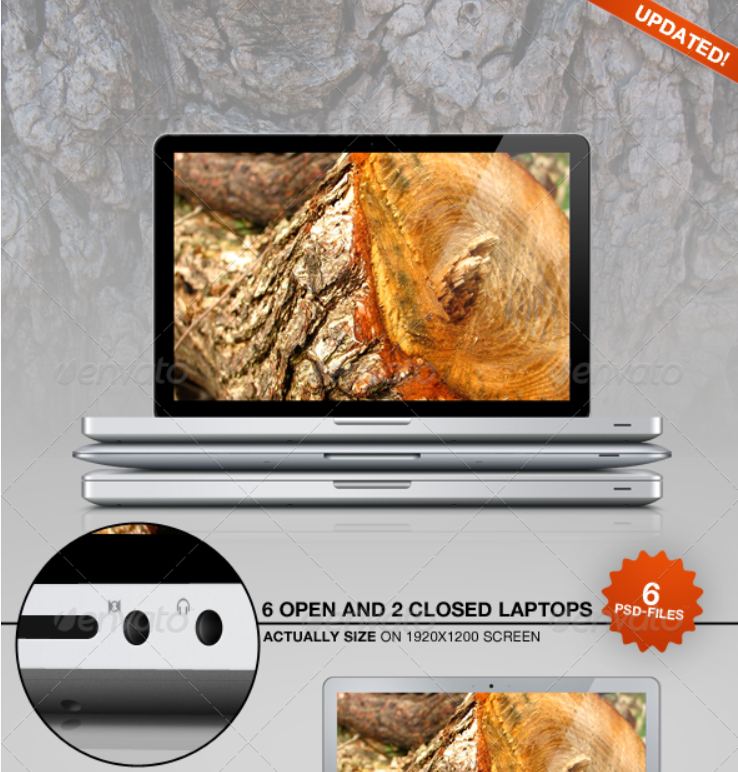 The set has 6 Notebook Screen Mockups and 2 LCD Screen Mockups in ultra realistic quality. 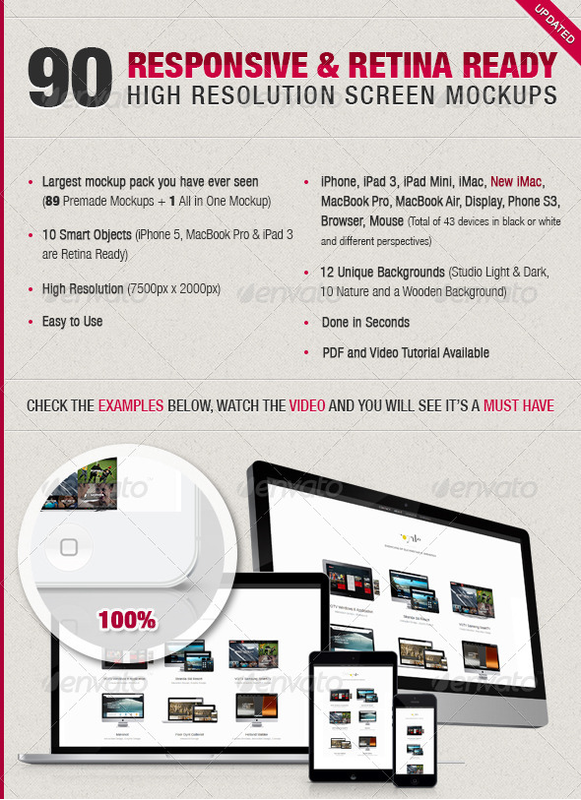 Great for Screenshots, Interface Design, Websites, Wallpapers, Photography and more. 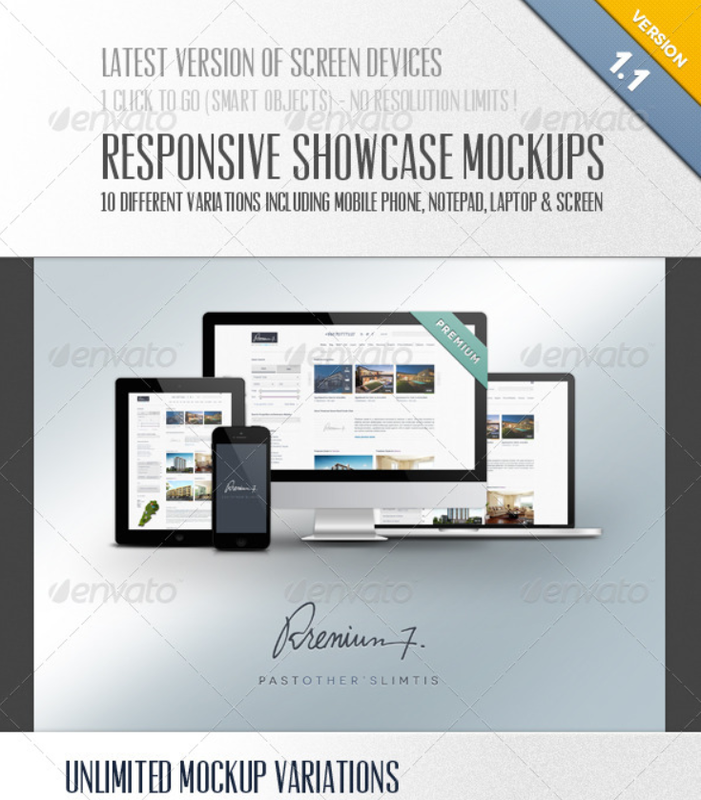 This pack allows you to display you designs with 10 different Design Layout. 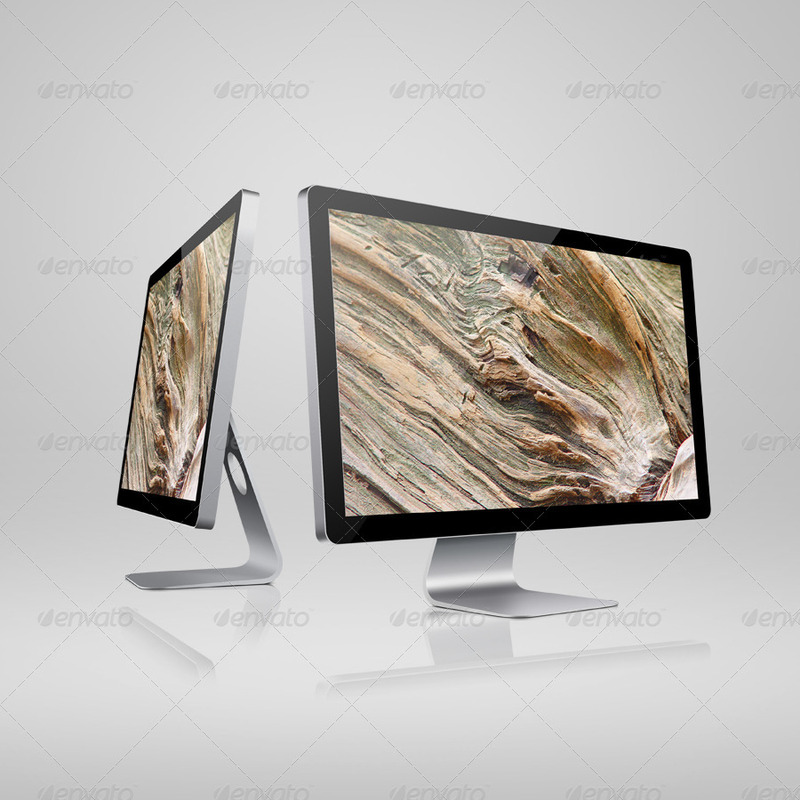 This pack contains iMac,iPhone,iPad, and Macbook mockups. 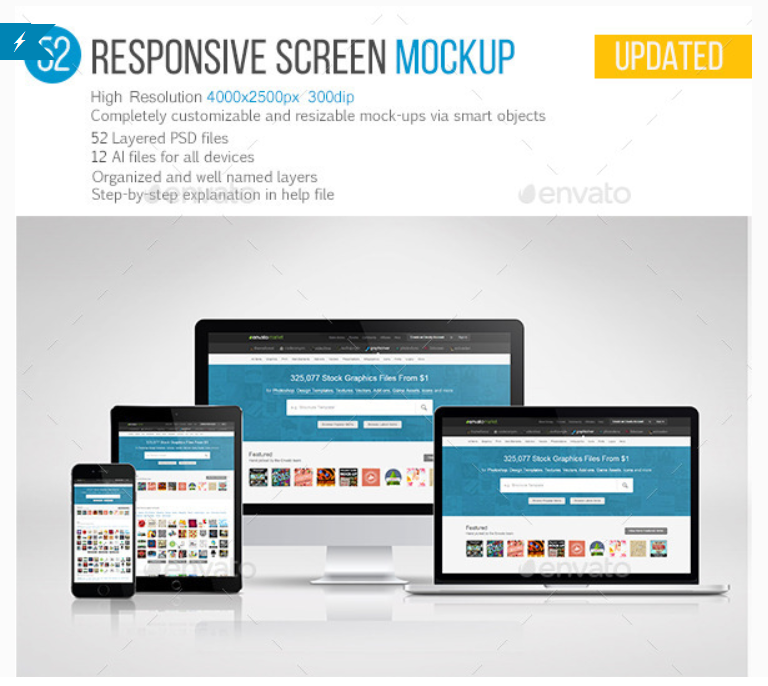 90 Responsive & Retina Ready Screen Mockups are modern and professional device mockups ideal for presenting your responsive websites, application design or photos. You can use one of the 89 premade templates or create your own with All in One Mockup. The file includes 9 different devices in black & white and different perspectives.